PT Tech's CMD series are friction-type compact multiple disc torque limiters for levelers and flatteners on steel processing lines and other high torque, limited radial space applications. They perform best on the slow speed side of a gearbox. The most typical application is a leveler/flattener on a steel processing line. The torque setting is set at the factory and does not require adjusting throughout its wear life. Wear life indicators are available on most designs. CMD units protect drive components from damaging torque overloads. Also, when significant tension differential exists between the entry and exit rolls, the CMD's will slip just enough to evenly distribute the load. Typically, CMD units are custom designed to your specifications. Please contact us with your specific equipment requirements. There are two different design configurations, output shaft mounted (front page) and mid-spindle mounted (back page). Examples of each configuration are shown. Maximum torque is affected by the available shaft engagement length (DIMENSION E), distance between centerlines of the output shafts, and the strength of available springs. Mounting bolt hole pattern is flexible. It must be greater than dimension "C" and less than "A." 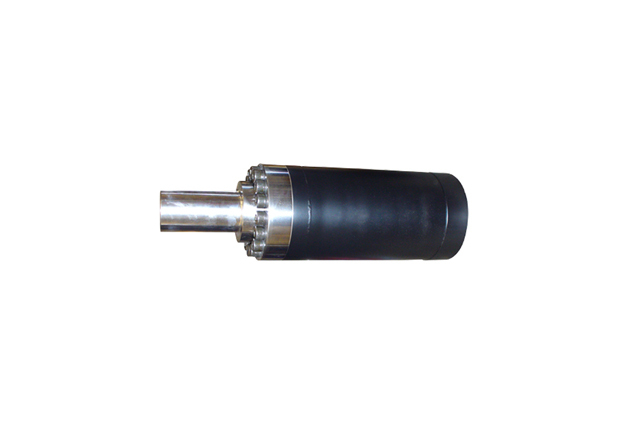 MID-SPINDLE MOUNTED: This design is used in extremely limited space applications. The torque limiters mount within the spindles and are staggered to maximize radial space.